The DLC conducted a training workshop for mentors on January 21, 2017 at Son Rise Church in Kill Devil Hills. 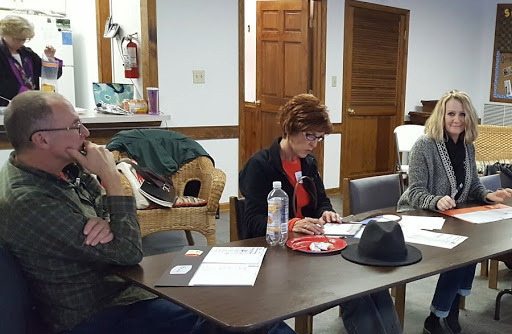 Among those participating were: (pictured) Brian Hart, Terrie Hart, Betsy Grant and (not shown) Pixie Wescott, Lisa Kimball and Ruth Crownover. Our Dare Literacy Trainers were: Lynn Blackburn, Susan Firman (shown in the kitchen), Nancy Dunlap and Bill Sport. Congrats to our new tutor mentors! October 2015 Book Sale Fundraiser Soars! Over 200 customers enjoyed the DLC's Fall Book Sale on Saturday, October 10, 2015. People lined the doors in anticipation of the 9 am opening. The $3500 (before expenses) received on the sale day is the largest amount ever raised through this fundraiser. A special “thank you” goes to our dedicated volunteers, donation sites, and business groups/other donors and customers who make this effort easier to handle each year!! Maria Serna moved to Manteo from Trujillo, Peru, in 1994 to be with extended family. 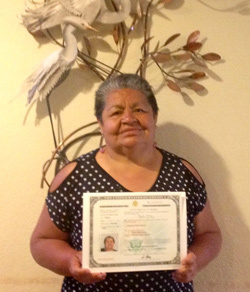 In December 2014, Maria’s 20-year dream of achieving U.S. citizenship came true. This dream became reality in part due to the efforts of the Dare Literacy Council. 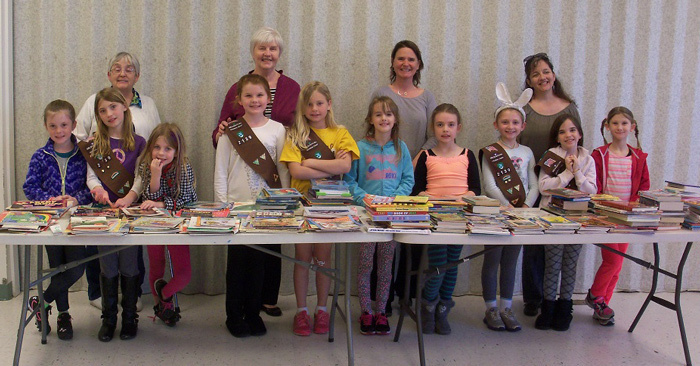 Brownie Scout Troop 2139 collected 355 children’s books to for the Dare Literacy Council’s Spring 2015 Book Sale. Great job girls! Pictured front row (l-r): Schuyler Wilson, Emma Walsh, Gracie Allen, Skylar Wood, Rylee Lundy, Isla Blankenship Wasniewski, Abby Edwards, Giana Lawrence and Cameron Piland. Back row (l-r): Patti Ann Sherrock (DLC), Lynn Blackburn (DLC), troop leaders Kathleen Wasniewski and Susan Lawrence. Mary Berntsen, one of the original founders of the Dare Literacy Council passed away in August 2014. Mary was instrumental in the formation of a group known as Dare Volunteer Tutors in the late 1980s. Because of her tireless efforts, the group grew into what is today known as the Dare Literacy Council. Mary was active with the DLC for almost two decades and her spirit and enthusiasm will be sorely missed. DLC Board Chair Lynn Blackburn and Deb Whitman of COA (College of the Albemarle), who is also a DLC Advisory Council member, attended the NC Literacy Association Conference in May 2014 in Greensboro, NC. They represented the collaboration between the DLC and COA and their partnership in the Basic Skills Lab at the COA Dare County campus. April 2014 Book Sale Our Best Ever! Volunteers are needed for future book sales. • Continue to donate wonderful books!! 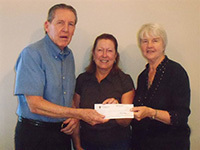 Bill Cogger of Grace Lutheran Church By-the-Sea presented a $550 check from their 2013 fish fry fundraiser to Dare County Literacy Council Board Members, Nancy Dunlap (L) and Lynn Blackburn (R). The funds from this successful summer fundraiser were shared with three local non-profit organizations including Dare Literacy Council, Interfaith Community Outreach and the Food for Thought Program. This generous donation will help fund the workbooks and additional materials needed by the DLC tutors and students to reach his/her goals for the future. 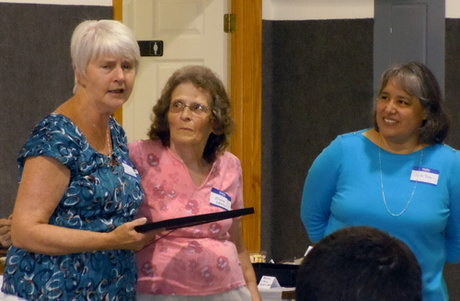 The DLC's first dinner to honor its volunteers and students was held at the Son Rise Church in Kill Devil Hills on September 12, 2013. 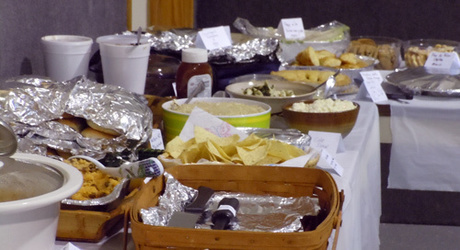 There was a tremendous variety of food from different cultures and plenty of hungry people to enjoy it. Several tutors and students attended, including two who completed DLC's Citizenship Prep Class and have since become US citizens. Two former board members were honored with a presentation of Certificates of Appreciation. 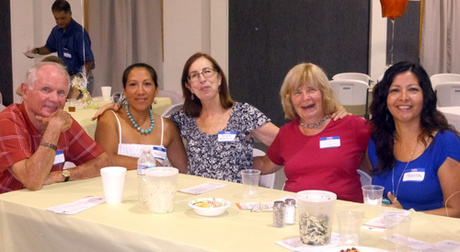 Center left, Susan Estrella served on the board from 2002 until 2011, including a stint as Board Chair from 2007-2011, and still helps with the website and other graphics. 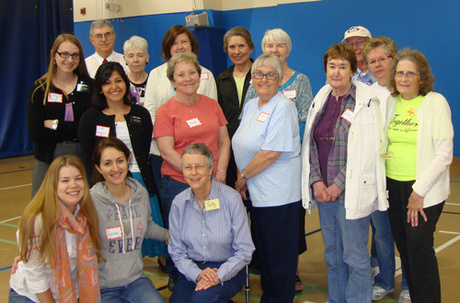 Center right, Elaine Dawson served as the Board Treasurer from 2002 until 2011 and still assists with the book sale and financial consultation. 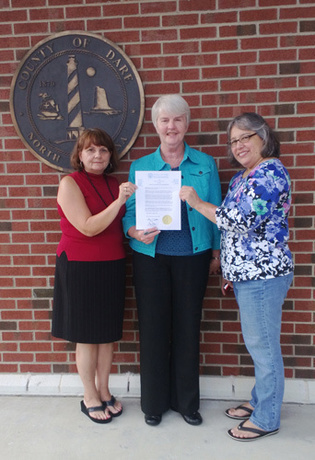 Dare County Commissioners, at the request of Dare Literacy Council chairperson Lynn Blackburn, declared September 2013 as National Literacy Month. At a meeting of the Commissioners on August 19, 2013 Ms. Blackburn thanked the Commissioners, the Outer Banks community and DLC volunteers for promoting the literacy of all adults in Dare and Currituck Counties. She highlighted the accomplishments of DLC students and volunteers in 2012: 42 tutors and 39 other volunteers worked over 2,500 hours to assist 32 ESL (English As a Second Language), 33 GED (high school equivalency test), five college preparation, and four basic literacy students. As a result, 13 received their GEDs, two obtained employment, two improved job skills, two pursued additional education, one achieved U.S. citizenship, and one improved college placement scores. In its declaration of National Literacy Month, the Commissioners recognized that (1) the need for a literate citizenry in Dare County has increased with an expanded labor market; (2) many citizens have literacy issues that severely impact their lives and families, and their ability to work productively; (3) the 2000 Census showed 20 percent of North Carolina's adult population had not completed high school; (4) community colleges, literacy councils, libraries and community-based organizations provided basic skills and literacy services to 162,000 people across North Carolina in 2004-2005; and (5) Dare County libraries and the College of the Albemarle collaborate with the DLC to provide guidance and resources to those wishing to improve literacy in their own or someone else's life. The Dare County Commissioners challenged all citizens to invest in the eradication of illiteracy in the Dare County area. Pictured above, board members (L-R) Sherry Robinson Sharpe, Lynn Blackburn and Jovita Drake show off the 2013 Proclamation for literacy. One man with a math disability took 3 years with two tutors to successfully complete his goal to obtain his GED. A 58 year old legally blind man wanted to complete his GED before losing his sight completely. He worked tirelessly with two different tutors and obtained his GED successfully after 1 1/2 years. Three female ESL students attended a Citizenship Prep class offered through the DLC at St. Andrews by the Sea in Nags Head. All three successfully obtained their US Citizenship. Since 2010, 40 ESL students have been tutored individually or in a classroom setting with individual tutors available once per week. Classes have been held at Mt. Olivet Church in Manteo and at Son Rise Church of Christ in Kill Devil Hills. Two gentleman recently achieved their common goals to obtain their GED so they could join a branch of the military service. A high school graduate asked for exam-preparation help to become a Merchant Marine. The following community organizations have partnered with us to provide meeting places for training, office space, classroom spaces for ESL classes and assistance with our bi-annual Book Sale fundraisers. April 2013 Book Sale a Huge Success! Over 9,000 donated books and more than 60 volunteers made for a successful DLC book sale on April 20th. Volunteers included representatives of College of the Albemarle International Club, Manteo and First Flight High Schools, the Gap Outlet Store, Church of Jesus Christ of Latter Day Saints, Boy Scouts, Cub Scouts and the DLC. Besides our fabulous volunteers (some pictured here), the following businesses and organizations helped with donations of space, supplies, and effort for the sale: Ace Hardware, Gateway Bank, Home Depot, Print Plus, Bushin Kan Karate, The UPS Store, Dare Government Center, Baum Senior Centerand the Dare County Family Recreation Park. We cannot thank them enough for their generosity. The $2,100 in sale proceeds will be used to purchase student and teacher workbooks and other supplies for GED and ESL classes. Nine new tutors were trained at the Tutor Training Orientation on March 9, 2013 at the Pitts Center in Southern Shores. Congratulations to the attendees: Christine Bean, Becky Fitzwater, Myrna Hayes, Sally Hotchkiss, Patricia Merski, Frank O'Hara, Joan Rose, Gay Statler and Kathleen Wixted. They were an enthusiastic group and we look forward to having them work with our literacy students. Former Dare Literacy Council volunteer William (Bill) Nolle of Kill Devil Hills passed away on Saturday, December 29, 2012. A memorial service was held at St. Andrews By the Sea in Nags Head. Bill was an integral part of the DLC and helped get ESL classes started in Manteo as well as a Citizenship class in 2011. He also participated in our training workshops and seminars. Bill's extensive background in literacy tutoring was a tremendous asset and his engaging personality will be remembered by all who were touched by him. Our heartfelt sympathies go out to his family. During a visit to Peru, Bill took the time to visit with the family of one of his Citizenship students (pictured a left). Bill's family has requested that in lieu of flowers, memorial donations be made to the Dare Literacy Council. Donations can be sent to the Dare Literacy Council at PO Box 7624, Kill Devil Hills, NC 27948. 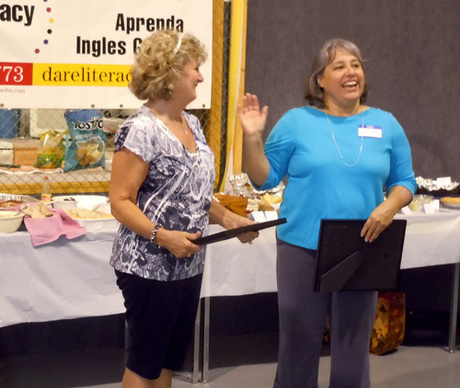 ESL student Necla Rader (left), pictured with Ex-Officio Board Chair Susan Estrella (right) recently donated $200 to the Dare Literacy Council. Rader, a local real estate agent and part-time restaurant worker, regularly donates to local charities. A native of Turkey, she recently contacted the DLC about improving her English skills and felt compelled to select the DLC as the charity she'd donate to. Thank you Necla for your generosity! Nicaragua native Yajara WIndley (center) successfully completed all of the necessary steps to become a U.S. citizen in December 2011. Yajara had been tutored by a DLC volunteer tutor several years ago and contacted the DLC in the fall of 2011 for additional assistance. With only a couple of months before her official citizenship exam, WIndley requested help from two different tutors. Volunteer Donna Buxton assisted Yajara with pronunciation and Richard Baer helped Yajara study the 100 civics questions for the exam. The actual exam consists of just ten questions, but there are 100 to be studied since potential citizens do not know which of the 100 will be on their exam. Yajara passed with flying colors and beamed during the swearing-in ceremony that took place in Raleigh in January 2012. Congratulations Yajara and kudos to her terrific tutors.